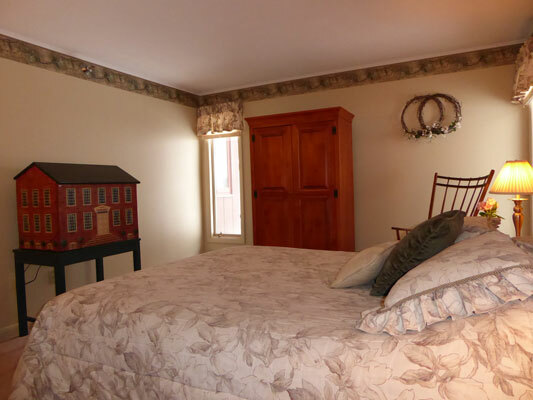 Traditional Shaker style is used to decorate Room 3 at Birch Ridge. 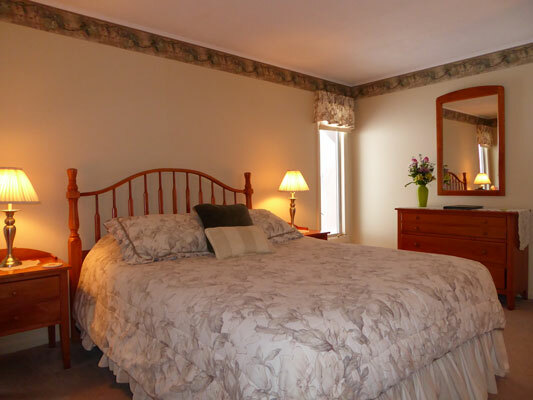 Upon arriving to Room 3 you will find a Queen sized bed with spindle post headboard made from Cherry. To add a touch of class, a Cherry Armoire is used as the closet. Cherry night stands and a matching mirrored bureau are also used to complement the room decor in the Shaker room. For enjoying a good book and quiet sitting in the room, a Spindle Rocking Chair is provided. Like all rooms at Birch Ridge, Room 3 includes a private bath, complimentary WiFi, a HD TV, and an alarm clock with usb charging port. To discretely hide the TV from view while it is not being watched, Mary found a unique addition to Room 3, a Colonial Doll House. To view the television (to watch the Weather channel of course during your stay) the front of the doll house swings up. When not in use, the front of the Doll House is moved down to conceal the television from view. We felt that this was a unique way to offer the best of both worlds. Start planning your visit to the Shaker Room with our Room Rate Calculator.